What does the term "underplay" mean in poker? 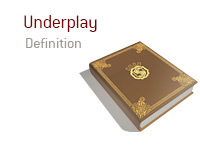 What is the definition of the term "underplay" in poker? In poker, "underplaying" occurs when a player hits a big hand but intentionally puts out small bets in order to lure more players into the pot. The idea behind "underplaying" is that you will allow players to hang around in the pot, hoping that their hands will improve so that they can pay off your big hand later in the pot. Let's take a look at an example of "underplaying". There is a raise from early position and a couple of callers. You are on the button and look down at pocket Nines. You decide to make the call. 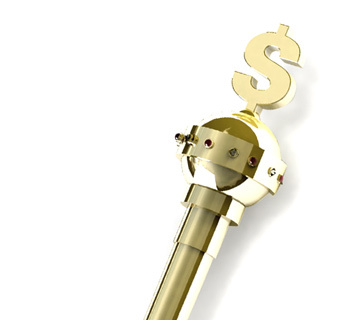 The SB folds, while the BB calls. The flop comes 9-9-K - this is obviously a great flop for you, as you now have Quad Nines. You decide that you are going to "underplay" your hand in order to extract as much money as possible from the other players at the table. The player in early position bets, the players acting after him fold, you call and the BB folds. The turn brings another K. This may be a very good card for you if your opponent is holding something like A-K. Your opponent checks, you put out a small bet for 1/3 the pot and your opponent calls. You are hoping not to scare your opponent out of the hand, and you are hoping that your opponent's hand improves by the river (but not enough to beat your hand obviously). Let's recap - despite flopping a monster, you called after the flop and bet just 1/3rd of the pot after the turn. You have tried to "underplay" your hand in the hope that your opponent will pay you off. The river brings the 3 of Spades. Your opponent checks again, and you decide to put out another bet for 1/3rd of the pot. After a bit of thought, your opponent elects to raise all-in and you snap call. Your opponent turns over pocket Jacks while you triumphantly show your Quad Nines. Your opponent incorrectly thought that you were weak due to the way that you played the hand - instead, you were actually very strong.